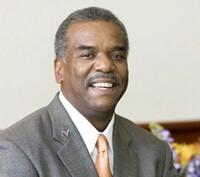 No one has done more to make the University of Virginia welcoming to disabled people over the last six years than Dr. Marcus Martin, U.Va.’s Vice President and Chief Officer for Diversity and Equity. Now, as he approaches retirement at the end of 2018, I want to take a moment to recognize his extraordinary leadership. I admire and feel grateful to Dr. Martin for many reasons; here are three. First, with many other pressing matters before him, from racial injustice to discrimination based on sexual orientation, Dr. Martin had the vision and commitment to include disability as part of his efforts to create an inclusive environment on Grounds. In 2013 he created a subcommittee of the Diversity Council dedicated to disability, opening the way to new progress. Before then, of course, many people at U.Va. worked to make the University more accessible and to draw notice to disability as an identity with social, cultural, and political significance. Still, overall disability often seemed a marginal concern. Suddenly having attention from a top-level, accomplished figure like Dr. Martin, whose office is in Madison Hall with the University president and provost, changed the climate. It made disability at U.Va. more visible and important. Second, when it came to disabled people, he got it. This comprehension is no small thing. In my experience, many people struggle with the intricacies of disability, which makes them uncomfortable talking about it, and as a result, it often winds up being an afterthought in conversations about diversity. (As a late-deafened person, I certainly have wrestled with the concept myself: what do I have in common with someone who is blind?). Disability is a capacious and heterogeneous category. Some disabled people do not want a “cure,” while others do. Some do not experience any physical pain, but some do. Because anyone can become disabled at any moment, disability is porous. It covers a range of conditions that may be physical, sensory, or cognitive and apparent or not apparent. Despite such complexities, Dr. Martin showed a firm grasp of the two things that unite people with disabilities: their desire to have the same access as nondisabled people do, and their desire to feel welcome and comfortable in their own skin. Third, Dr. Martin made things happen. He recruited 25 people from all over Grounds for the subcommittee, which eventually came to be called the Disability Advocacy and Action Committee (DAAC). Members included a professor of architecture and a staff member from facilities management, undergraduate and graduate students, a person from Athletics learning services, an association dean, staff from the Provost’s Office, other faculty and staff, and more. All members had a personal or professional interest in disability, but most had never had been in the same room together. With Dr. Martin’s guidance, things quickly happened. DAAC members adopted a mission statement that begins, “The University of Virginia values disability within the spectrum of human diversity.” I cannot tell you how heartening it felt to have a University Vice President endorse a statement like that. Other progress followed. The University’s American With Disabilities Act Coordinator position changed from being 10% of a position to 100%. DAAC also clarified the procedures for faculty and staff to request accommodations and advocated the hiring of a hiring of a Coordinator of Academic Accessibility, a position in Provost’s Office. Among other accomplishments, this new hire has created an online clearinghouse for disability access matters. She also has managed to get the University to close caption its official online videos, making them accessible for the first time to deaf people like me. In 2014, Dr. Martin threw the resources of DAAC and his office behind the first-ever disability studies symposium at U.Va., which featured select leading scholars from other places along with University faculty from a variety of departments and schools. The symposium has since become a biannual event, and in turn has led to a Disability Studies Initiative (DSI), a working group of ten faculty members committed to exploring the social and cultural aspects of disability from a variety of disciplinary perspectives. With funding from the Jefferson Trust, the DSI has become more established in recent years, with a goal of forming a minor or concentration in the future. The DAAC also focused attention on disabled students’ experiences, reviewing such areas as residential life and study abroad. The Student Disability Access Center became more active and vital, experiencing exponential growth. Barbara Zunder, the director of SDAC, says that the center currently has 1,619 students registered, or 7% of the overall student population, which is close to what a typical four-year university would expect. (The National Center for Educational Statistics at the Department of Education reports that the overall percentage of college-age students seeking disability services is 11%). Even the landscape is changing slightly. The University is installing two permanent ramps on Lawn, making the Lawn more accessible to wheelchair users. These developments, and much more, have happened in a climate created by Dr. Martin. He inspires people to work hard and get things done. I have learned much about leadership from Dr. Martin. With a wide variety of people, from students to community members to administrative leaders, he has the rare ability to connect with others and make them each feel understood and appreciated. He has taken the time personally to attend disability events in the evenings. Even as he takes on an ever-expanding portfolio, he never seems stressed and keeps his humor, a skill he doubtless put to good use as an emergency room doctor years ago. He has been showered with accolades for good reason. His many achievements on behalf of disabled people also deserve praise. Equally important, he has shown the way forward; as he would probably be quick to say, all change lies within each of us. Thanks, Dr. Martin, for all you have done. Christopher Krentz is an associate professor with a joint appointment between the English Department and the American Sign Language Program. He is also co-director of the University’s Disability Studies Initiative.